Although many of us first think of honeybees as wondrous honey-makers, their most essential role is the pollination of crops. Sadly, honeybees worldwide are under serious threat. International researchers are employing the technology of micro-sensors to find out exactly why. As a result of their evolutionary success and their significance in human food production, the European honeybee (Apis mellifera) is termed a super-species. We rely on honeybees for the pollination of one third of the food we eat. This includes fruit, vegetables, seeds, nuts and oils. The Commonwealth Scientific and Industrial Research Organisation (CSIRO), has established the Global Initiative for Honeybee Health – a large international team of researchers, beekeepers, farmers, industry and technology companies. This collaboration attempts to uncover what is harming bees and how best to combat these problems, thereby securing crop pollination. Healthy bees have predictable behavioural patterns, so any changes in these patterns gives an indication that they are under stress or that there is a change in their environment. Researchers have modelled the movement of bees using micro-sensors to better understand the effect that several stress factors have on honeybees. 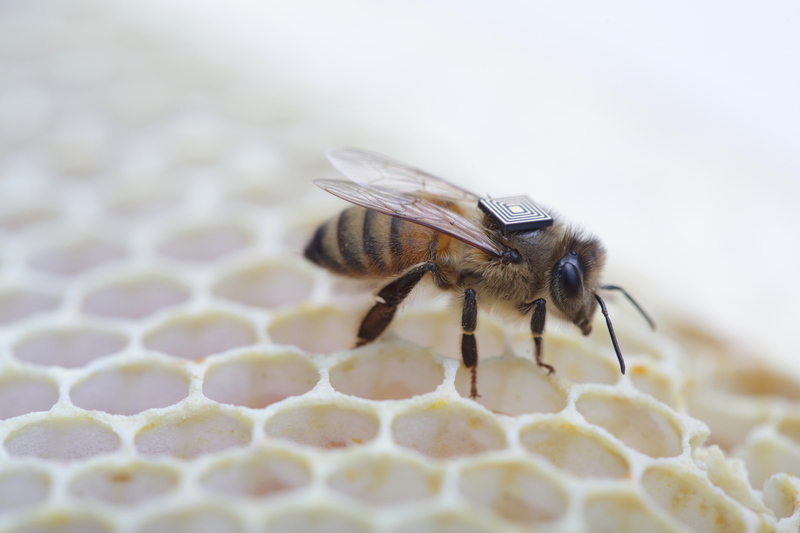 “The sensors, working in partnership with Intel hardware, operate in a similar way to an aeroplane’s black box flight recorder in that they provide us with vital information about what stress factors impact bee health,” says Professor Paulo de Souza, CSIRO Science Leader. The micro-sensors are manually attached onto bees’ backs and weigh less than the amount of pollen a bee would collect whilst foraging. Researchers model the movement of bees by recording when individual bees pass strategically placed checkpoints. The radio signals detected from the micro-sensors of multiple bees enable the researchers to build a comprehensive three-dimensional model to visualise how the insects navigate through the landscape. “The tiny technology allows researchers to analyse the effects of stress factors including disease, pesticides, air pollution, water contamination, diet and extreme weather on the movements of bees and their ability to pollinate,” says Professor de Souza. The social nature of honeybees means that they can make excellent use of the available resources; discoveries of flowers are easily communicated between individuals in a hive. However, this arrangement comes at a cost. Crowded hives make bees vulnerable to disease, especially as colonies can expand to 60,000 individuals in the summer months. The researchers are also investigating the cause of bee deaths en masse, hoping to identify the key factors, or the combination of factors involved. The decline of honeybees has been mainly linked to two diseases: Colony Collapse Disorder (CCD) and the Varroa mite. CCD is identified by a sudden loss of worker bees, however there is currently no explanation of what causes CCD or why it is occurring more frequently worldwide. Varroa, the most pervasive pest to honeybees, attack developing larvae thereby shortening their lifespan and eventually destroying the entire hive. The Varroa mite has wiped out colonies at a staggering rate worldwide, arriving in New Zealand in 2000. Australia is the only country where the Varroa mite does not affect the honeybee. Dr Cunningham, a pollination researcher at CSIRO comments on the suitability of Australian honeybees to act as a control group in research on this major problem that is likely to affect Australia in the future too. This highlights the significance of the international nature of this work. 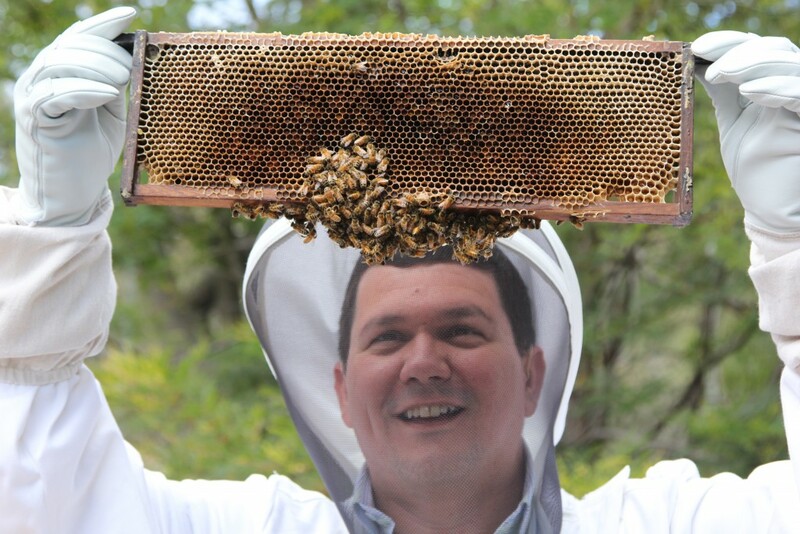 “The time is now for a tightly-focused, well-coordinated national and international effort, using the same shared technology and research protocols, to help solve the problems facing honeybees worldwide before it is too late,” says Professor de Souza.